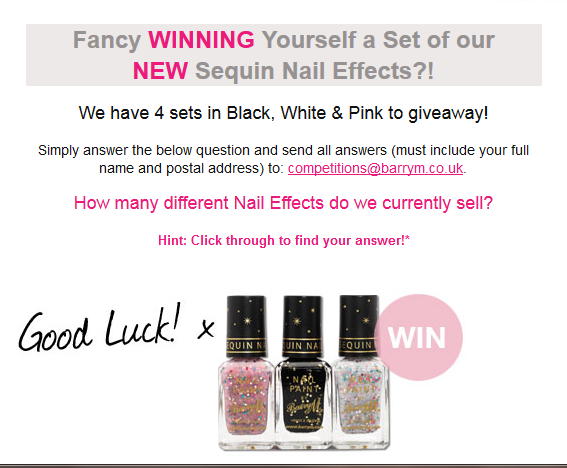 Northern Nails News: Barry M - Textured Nails and a Competition! Barry M - Textured Nails and a Competition! *All answers must be received by 9am Friday, May 31st BST. Winners will be picked at random and will be informed via email by 5pm, Tuesday June 4th BST. Terms & Conditions apply. Labels: Barry M, Barry M Competition, Barry M sequins, Barry M textured Nails, nail art, nail polish, nail polish competition.